Last month, Single Payer Action, It's Our Economy and a group of 50 doctors filed a brief with the Supreme Court. We called on the Court to strike down Obama's mandate. The mandate that requires every American citizen to buy a product from private health insurance corporations. We argued that we should instead get rid of the private health insurance corporations. And replace them with one single payer -- everybody in, nobody out. The brief has gained support from some unlikely sources -- including Dr. Arnold Relman -- former editor of the New England Journal of Medicine. On Tuesday March 27, 2012 at 8:30 am, we will take our argument to the steps of the U.S. Supreme Court. 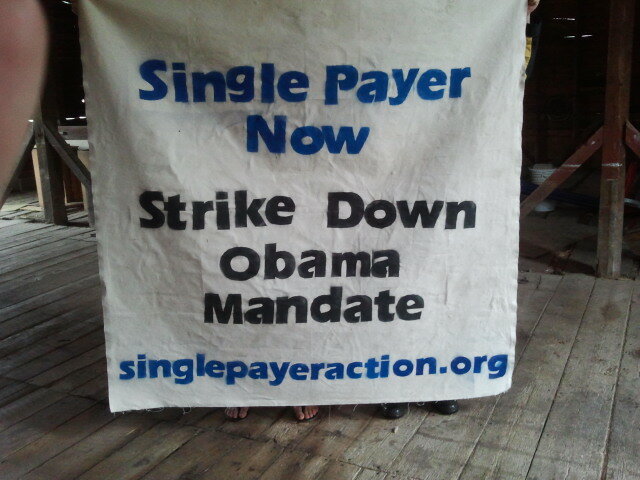 As you can see, our sign says -- Single Payer Now, Strike Down Obama Mandate. If you are in the area, hope you can join us. If not, check in for updates at singlepayeraction.org.